The Prime Minister, Peter O’Neill received a courtesy call from New Zealand’s High Commissioner, H.E. 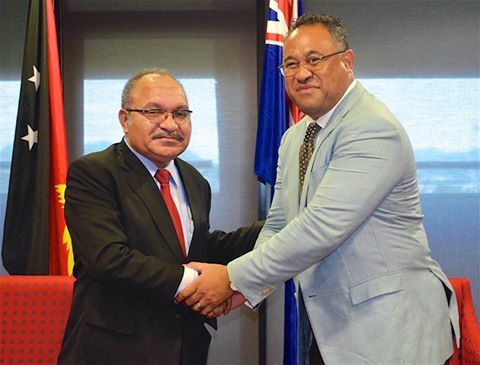 Tony Fautua, to discuss ongoing co-operation with Papua New Guinea, and the visit by New Zealand’s outgoing Foreign Minister, Hon. Murray McCully MP, in February. The Prime Minister and High Commissioner also discussed engagement in the areas of customs and quarantine procedures, advancing the air services agreement between the two countries and support for APEC Papua New Guinea 2018. “New Zealand and Papua New Guinea have a very strong relationship and this will improve further,” the Prime Minister said after meeting High Commissioner Fautua in Port Moresby today. “The New Zealand Government, led by Prime Minister, Bill English, has expressed interest in deepening relations and exploring new opportunities for co-operation. "We hope Prime Minister English will make his first formal visit to Papua New Guinea soon and further strengthen relations between our countries at the highest level. "The close relationship we have had with past Prime Minsters and the Foreign Minister has made a lot of difference in relations between our countries and this will continue. "New Zealand has been active in a range of projects that have advanced the lives of many Papua New Guineans, in many regions including Bougainville, and he is interested to take a last look at the development of these projects. "We appreciate the commitment that Murray McCully has given to Papua New Guinea and countries around the Pacific. The Prime Minister said engagement in a number of bilateral areas is set to expand and this will be beneficial for both countries. “Trade Minister, Richard Maru, is in discussion with New Zealand on a number of important areas that will build Papua New Guinea’s capacity in customs and quarantine procedures that will make our own domestic food production sectors more resilient. “Both Papua New Guinea and New Zealand are also seeking to enhance our direct people-to-people engagement through strengthening air links for trade and tourism. “I look forward to our officials advancing these discussions. "Papua New Guinea further appreciates New Zealand’s support as we prepare to host APEC in 2018. This includes training for liaison officers, technical advice on logistics and support to our APEC Business Advisory Council engagement capacity.